I’m keeping today’s post short as the last 2 have been long and at times technical and my brain hurts, I didn’t rest enough yesterday and felt awful because of it. I don’t know about you!! Yesterday I re-read the research protocol for the PACE trial. I re-read it because I wondered what tools the researchers used to measure the outcomes for the participants in the PACE trial. In the Abstract, they call them the Case Report Forms. What I mean is, what did the form / online form / piece of paper look like – the ones that were handed to the participants that asked them to say how they were before, during and after treatment. I was interested because the type of form you hand out to research participants can make a difference to how a participant responds to it. I’m not being clear about this …I’ll try again. Here’s a Likert scale – you’ve seen these before, right..
Well, researchers have noted that there are a lot of problems using Likert scales in research. Mainly because people tend to answer towards the positive end of the research scale, rather than the middle or negative end. Humans are attracted by positive statements in these scales. It’s a human thing about our cognitive biases – how we think. It produces unnaturally positive results. The statistics will be wrong and so the results will be wrong too. You don’t want to build this into your research design because it essentially unbalances and invalidates the research results. As you aren’t allowed to stand over participants in research studies and tell them what to do when they are filling out forms, you have to go back to the drawing board and make sure your research response form is right in the first place. Thankfully in using Likert scales, there’s a lot of good work that has already been done by research statisticians, to make the right changes in response form design. Good research practice also dictates that researchers test out the response forms. They given out with a sample of people and tested out before they use them in a research study – this is called a Pilot Study. The Pilot Study is designed to eradicate or indicate where tweaks need to be made before you go ahead into the research study proper. 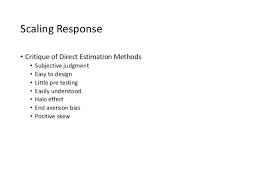 Question 1 : Was a Likert scale used as the response form or forms in the PACE trial? Question 2: Was a pilot study carried out using the PACE trial response forms? Question 3: Were there any issues with the response forms that the authors acknowledged could have skewed the participant response? Question 4: What changes were made as a result? Question 5: Does anyone have access to the response forms used with participants in the PACE trial and could circulate a copy? This entry was posted in All Posts, Graded Exercise Therapy MECFS, Healing and Improving MECFS Symptoms, MECFS and NHS Care, MECFS Research, MECFS Symptoms, NICE Guidelines MECFS, PsychoSocial Model Of CFSME and tagged Cognitive Behavioural Therapy, Graded Exercise Therapy, PACE Trial MECFS, Psychiatric Research. Bookmark the permalink. How odd. I always thought – and I am not relying on any professional qualifications of relevance here – that ‘human nature’ would tend to see people opt for the middle option on a 1-5 scale.